A conventional grocery store, Richland Markets was founded in 1951, by Gus Pallios and John Pallios. The company served for about sixty years. The initial Grocery stores was established at a southwest corner of Evans and Richland, in Ceres. In 1971, the market was shifted to its present position, inside the Shopping Center of Richland. The store was also refurbished at around late 1980s. During their golden period, the grocery store operated seven stores at Modesto, Oakdale, Turlock and Ceres. However, in 2005, they began to feel the heat of changing market trends and started downsizing, when economy began to hit smaller business enterprises. There are currently 0 consumer reviews about Richland Markets available. Share your review. Please take a note that you are about to post a public review about Richland Markets corporate office on CorporateOffice.com. This review will be public, so please do not post any of your personal information on this website. 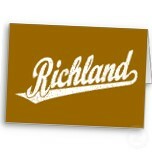 If you would like to contact the corporate offices of Richland Markets, please use their contact information such as their phone number, website, and address listed above to contact them. However, sometimes staff from Richland Markets headquarters do read the reviews on this website.